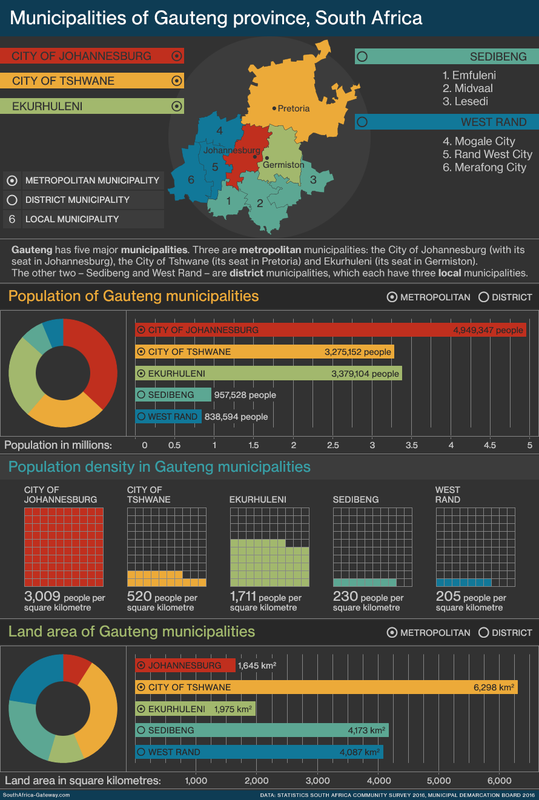 Local government in the city region of Gauteng is organised into five major municipalities. Three are metropolitan, and two are district municipalities. The districts are further divided into six local municipalities. Gauteng is the smallest province in South Africa. But a quarter of the country’s people – 25% – live here. Gauteng is mostly a region of cities. Its local government is organised into five major municipalities. Three are metropolitan municipalities: the City of Johannesburg (with its seat in Johannesburg), the City of Tshwane (its seat in Pretoria) and Ekurhuleni (its seat in Germiston). The other two – Sedibeng and West Rand – are district municipalities. Sedibeng and West Rand each govern three district municipalities. Infographic: What languages are spoken in South Africa’s provinces? Thanks and credit to Htonl, who makes public-funded data available to the public and creates maps of South Africa you can’t find anywhere else. Researched, written and designed by Mary Alexander.